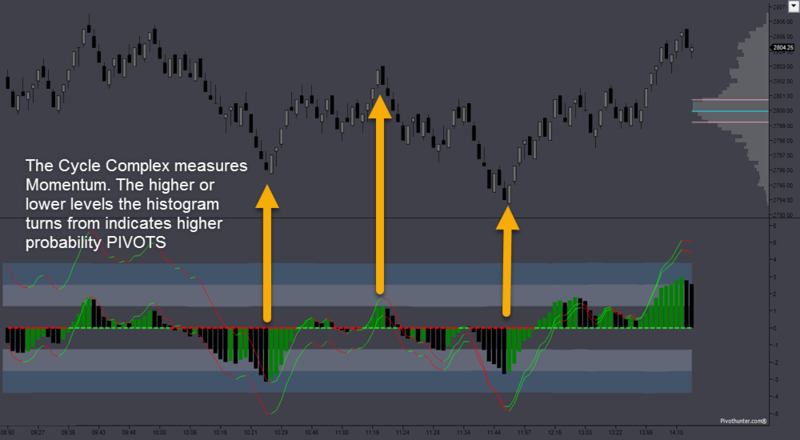 THE CYCLE COMPLEX indicator is a four part measurement of price momentum all rolled into one indicator. The histogram is the main part accompanied by a couple of lines of higher sensitivity. When the histogram is in the bands and turns, the pivot is typically stronger. If the histogram is above or below the bands, the potential is even greater. The red and green dotted horizontal line is the Bull Bear Line. Green is when the histogram is above this line and red when the histogram is below this line. FIRST: SOMETIMES THE ANGLER WILL APPEAR AS ONE COLOR. THIS MEANS IT NEEDS RECALIBRATION. GO INTO THE INDICATORS PROPERTIES WINDOW, SELECT THE ANGLER, SCROLL DOWN TO SECTION 7 AND SELECT ‘RECALIBRATE NOW’ AND CLICK ‘OK’, INSTEAD OF ‘APPLY’. SECOND: THE INDICATORS ARE SIMPLE IN LOOKS, BUT THEY ARE EXTENSIVE IN DATA PROCESSING. PLEASE GIVE THEM AMPLE TIME TO LOAD.